Here we are…Wednesday already! So much for my promised post with a new card. Well, maybe in the next few days. This pesky studying is getting in the way of my blog work! 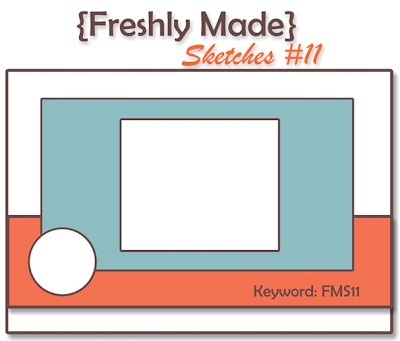 *smile* Fortunately I have a great sketch for you from Freshly Made Sketches. This one is courtesy of none other than Lesley Croghan from Always Playing with Paper (aka, the woman who cannot possibly ever sleep for all the amazing things she does!!). I figured it was about time to show you a Valentine’s Day card seeing that it is February! This is the card I have made for my husband this year (shhh, don’t tell him). I hope the bow doesn’t make it too girly but, after all, it is from me and I LOVE a bow! Rose Red and Basic Gray are great together and it seems like forever since I have used Rose Red. The Adorning Accents Embossing Folder hearts were my starting place for this card. I thought they worked perfectly in the sketch. I dug out one of my favorite retired sentiments from a set called Well Scripted. I created a scalloped border using the Adorning Accents Edgelit. So easy to get those perfect scallops! A bow from the Rose Red Seam Binding was all that I had left. I created a “potato masher” bow and then added a Basic Gray button. As usual, the Freshly Made Sketches design team has made fantastic examples for you! We are welcoming Kim of Joyful Creations with Kim and Tracey of My Creative Side as our guest designers this month. What talented stampers! Hope you can join us in the challenge! This week holds another test of sorts. Now we get into different phases of flying check rides. Our “validation” on Friday will be on procedural items. Basic checklists (getting the aircraft ready to go, inflight checks, taxi and shut down procedures), instrument procedures and flying both missed approaches and landings. Missed approaches are when you cannot land for weather, runway conditions or whatever and need to take the airplane back around for another runway or airport. This is where the three years off shows most to me and I will be studying a lot this week. If I am a bit remiss on commenting, I promise I will catch up after the check. I hope your week is great and I very much appreciate you stopping by today! See you soon! Take a look at the fabulous sketch from Freshly Made Sketches this week! 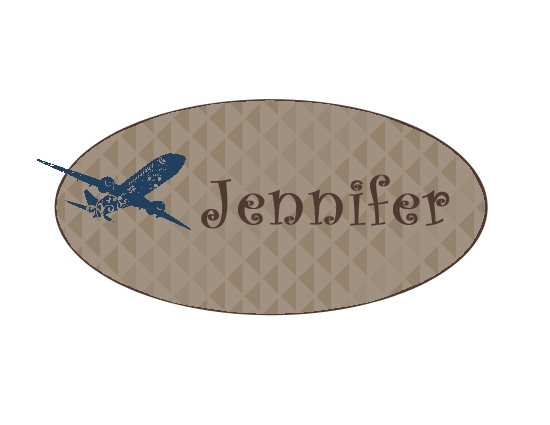 This sketch is courtesy of the amazing Linda Callahan of Stampin’ Seasons. She makes the most lovely cards and you just have to go see her version of this layout! Of course, the rest of the team has made some amazing projects too. With such clean lines to the sketch, I chose to use the KISS (Keep It Simple Stamper) principle. I pulled out my Fruit & Flowers stamp set and chose this pretty little flower. The background paper is from the coordinating Berry Blossoms DSP and I let those colors be my guide. Calypso Coral and Early Espresso are so fantastic together! I attached some Early Espresso (retired) Satin Ribbon with one of the brads from the Sale-a-bration package and finished with a sentiment from Teeny Tiny Wishes. 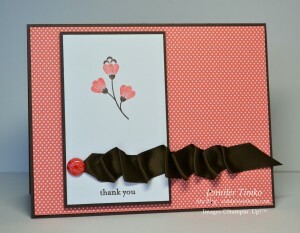 I love the spring feel of this and it helps me with my continuing need for thank you cards from the holidays. Well, yesterday was my first day of Airbus training and my brain is getting full of lots of numbers. Not too bad so far but I know today will hold many more hours of classroom work. I’m going to keep this one short so I can get back to the books. Thank you so much for all the kind wishes on my training! I’m so glad you were able to drop in today. Make sure you take a look at the design team’s gorgeous work! I’ll be back next Tuesday with a new SUO Challenge. Until then, have a wonderful week! 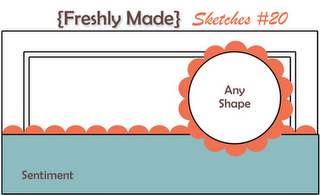 Now look at this fabulous sketch over at Freshly Made Sketches this week!! This one is courtesy of the lovely Rita Wright from Rita’s Creations. 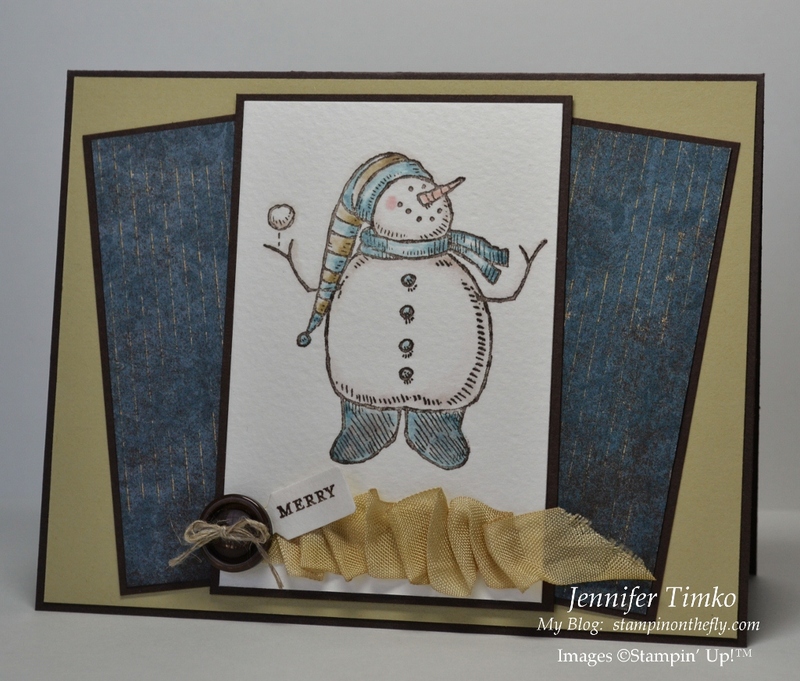 Rita is such a fabulous stamper…you will just love the card she has made with her own sketch! Make sure you go take a look at her creation and those of the other designers on the team. I decided take a masculine direction with this one. I love this leaf from Faith in Nature (Hostess). For this one, I inked with Versamark, then Early Espresso and stamper. 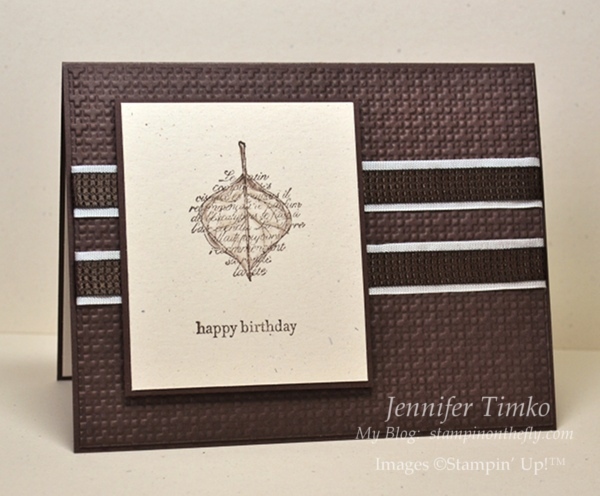 Then I heat embossed with Clear Stampin’ Emboss Powder. I only did a little light coloring to add some depth. I embossed the background with the Big Show and my Square Lattice Embossing Folder. For the crossing panels, I added some Early Espresso Quilted Satin Ribbon (Holiday Mini). I love how the ribbon looks with the embossed background. I hope your week is going well. I can’t wait to see everyone’s use of this sketch! I’m certain the entries will be spectacular. Have a great day! 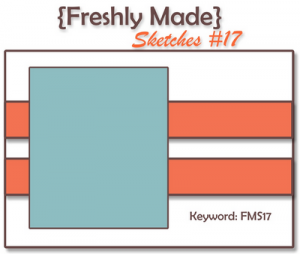 Welcome to a new year of challenges from Freshly Made Sketches! This week’s sketch is courtesy of the amazing Tui Nathan of Stampin-Time. Her style is always highlighted by the most lovely details and she has brought us a layout that lends itself to so many possibilities. With the beginning of a new year it seemed appropriate to use this sketch for a baby card. My husband works with the West Virginia Air National Guard and as you may imagine there are some serious West Virginia fans there. This was my color motivation since this card is for some friends from work who had a baby boy. I pulled out my Button Buddies set. It is one of my favorites from the new catalog for the pure fun of it! The sentiment is from Teeny Tiny Wishes. I used a print from the Just Add Cake DSP against a Night of Navy background. Some retired Night of Navy Satin Ribbon was used to add a little dimension across the card. Of course the buttons make this…aren’t they fun??!! You will be impressed with what the design team has done with this sketch and we can’t wait to see what you will show us! Come along and join the fun! Today is the first day back at United Airlines for me. Wish me luck in going back to “school” (more here if you missed the announcement)! Thanks for stopping in today. See you soon! Happy Wednesday! 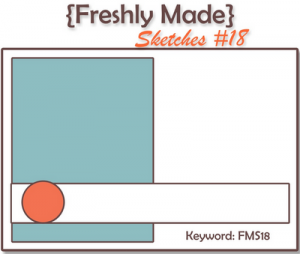 I am here with Freshly Made Sketches Challenge #15. The lovely and talented Cindy Hall from Pretty Impact brought us the sketch today. I love that it is different and made me think a bit. I tend to go towards linear things so those little tilted panels seem to add such interest! I knew when I saw the layout that I wanted one of the snowmen from Snow Much Fun to be on the center panel. I chose this little trouble making fellow because my boys really like him. They love that he has a sly grin as he gets ready to start a snowball fight (much like two little boys I know). I wanted to make him a little bit vintage but with a “clean” twist. No distressing or sponging here. I used the colors from Well Worn DSP as my starting place to color the snowman (Not Quite Navy, River Rock, Early Espresso). I then chose this Not Quite Navy print for the panels and River Rock stock as a background. It was still missing something so I added some River Rock Seam Binding. What was that??? River Rock?? Ok, I really added some Very Vanilla Seam Binding that had been dyed River Rock. Dying is a great solution when you only need a little of a color. A button tied with Linen Thread and a part of a sentiment from Teeny Tiny Wishes punched with the Jewelry Tag Punch were the finishing touches. I hope you like my “vintage light” version of a snowman. Just wait until you see what the rest of the team has made. As always, their work is so fantastic! Thanks so much for stopping it today! I hope your week is going well. See you again soon! 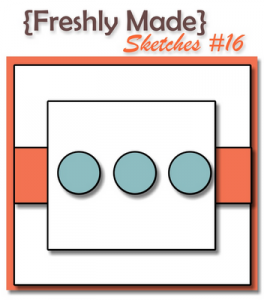 Welcome back to another challenge from Freshly Made Sketches! I am the hostess this week and this is my very first sketch! I love square cards so it seemed perfect to use one this week. I also know that in the middle of holiday card making I seem to end up with lots of designer paper scraps. I hoped that this sketch would provide a way to use them. When I intially designed the sketch I had intended to use it very literally with a snowflake from Northern Frost. I realized, however, that I have been using that die a whole lot so wanted to shake it up a bit….but not too far. I went with my go-to stamp set for the season this year, Bright Hopes. I love this wreath! 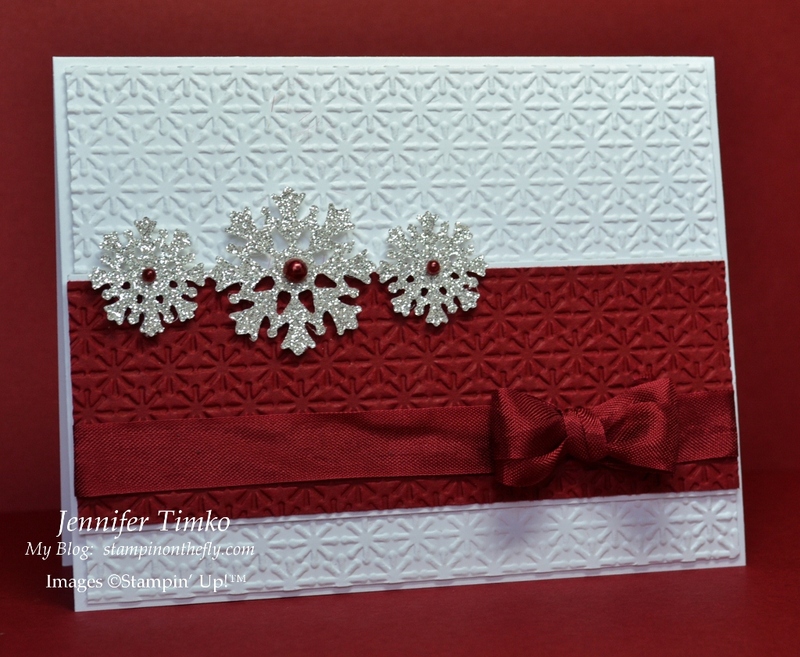 Jen Mitchell has been using her Deck the Halls DSP from last year on a lot of cards lately and I have been admiring them all! I went digging in my paper pile. Low and behold…I had some! Yippee! And how pretty it is with the wreath! I wanted to add a little bow to the wreath and chose to do another fork bow (tutorial here). I used the Early Espresso Quilted Ribbon for this one. I chose to put the sentiment in place of the snowflake and keep it clean. Well, since the design team has already made some fabulous cards with the sketch, I am breathing a bit easier. Make sure you stop over the the challenge site and see them. I love the variety of interpretations! I know you will show us even more cool ways to use the layout! Thanks for stopping by today. I hope you are having a great week! See you again soon! 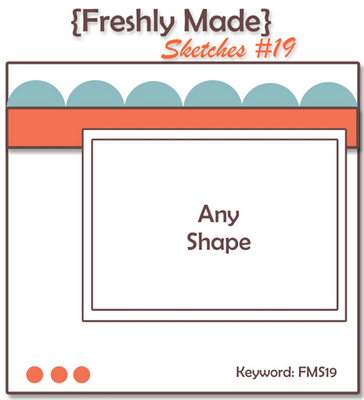 The layout from Freshly Made Sketches this week is courtesy of the amazing Lesley Croghan from Always Playing with Paper. Lesley is an incredibly talented stamper (who apparently never sleeps!). She is the creator of the Freshly Made Sketches Challenge as well as the Paper Players Challenge. All this takes a back seat to her just being a fantastic person…make sure you go check out her blog. I know you will find new favorites there. I definitely put emphasis on the clean part of the design today. I knew I wanted to use the Silver Glimmer Paper to create snowflakes with my Northern Frost Die and wow are they pretty (sadly, the camera just never captures the sparkle). With the emphasis on those snowflakes I kept the rest of the card fairly neutral. I used the Snow Burst Embossing Folder on both Whisper White and Cherry Cobbler then chose one to show the embossed side and one to show the debossed side. I tied on some Cherry Cobbler Seam Binding for balance and then topped off the snowflakes with Basic Pearls. Yes, I did color them Cherry Cobbler. You see, I have a brother-in-law that used to work for Sharpie and when I was up visiting their house a couple of weekends ago I asked if they had this color. When my dear sister-in-law said she did, she was kind enough to let me come home with it. I debated adding a sentiment but, after staring at the card for a couple of days, decided to go without. I may add it on as a tag from the bow. What do you think?? You will be amazed by the work the design team has for you this week. Such wonderful variety!! 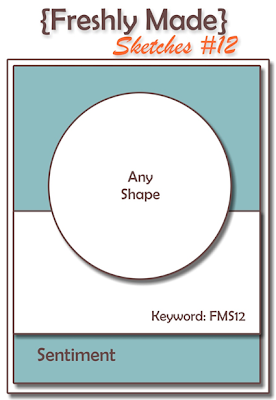 I can’t wait to see what you do with the sketch…so many choices for those shapes! I’ll be back tomorrow with my latest project for the Creative Crew. Until then, have a great day!! Thanks so much for dropping by! Happy Wednesday! 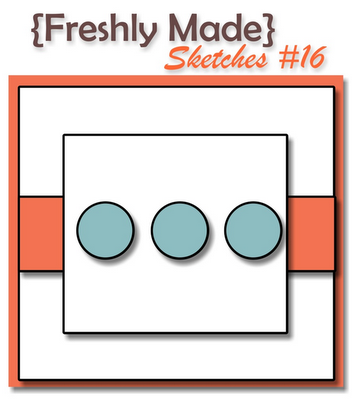 Welcome back for another fun challenge from Freshly Made Sketches! This week’s sketch is courtesy of the amazing Jen Mitchell from I Create and boy does she ever create! Her style is so cool. 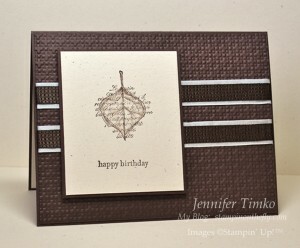 She has a knack for wonderful clean lines but her cards always have a “wow” factor! I took another non-holiday turn for this card. I don’t know about you but I have some family members who have December birthdays. I always try to make something for them that makes them feel special and that in no way reflects Christmas. So out came the Beau Chateau DSP and off I went. This paper seems to call out for a flower but instead of stamping one, I created one from my Fun Flowers die. I folded up a piece of wrapping tissue paper and ran it through the Big Shot. Since my tissue paper was white and this paper has a sponged element I sponged the layers with some Crumb Cake ink. The center of the flower is a Crumb Cake button from my Neutrals pack. The little banner is stamped on another piece of DSP from the set and grounded with an additional button. A little bit of Linen Thread was tied onto both buttons to complete the look. Between the Big Shot and the DSP, this is one of those cards that looks harder than it is…love it when that happens! Thanks so much for dropping in today. Make sure you go see what the rest of the team has created to inspire you. They always amaze me! I certainly hope that you get some crafting time this week and will show us your version of the sketch. I will be off for a few days for the Thanksgiving holiday but next week promises to be full of posts! For those of you in the US, I wish you a safe and blessed Thanksgiving! See you soon! Welcome back for another Wednesday challenge from Freshly Made Sketches! 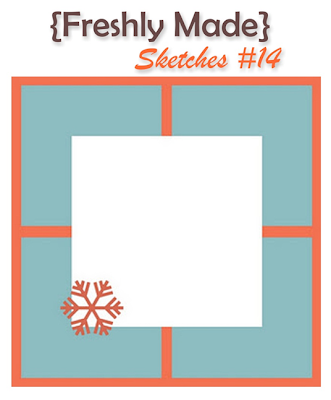 This week’s sketch is courtesy of Linda Callahan from Stampin’ Seasons. She is a remarkably talented stamper and her sketch has so many fantastic possibilities. I figured it was time to pull out a Christmas card for you so here is my tall snowman from Snow Much Fun. I will warn you about the hazards of stamping with people like the design team at FMS. I had resisted this set all the way until my last order. After I saw SO MANY cute cards, I realized that “resistance is futile”!! So…here he is! The best part is that the watercoloring takes almost no time at all. Fabulous! Now in order to make this guy work for the sketch, I had to, um, cut off his legs. There are some (Karen Barber – who also had a hilarious set of cards about the two snowmen) that believe snowmen should not have legs. Frankly, I can see the virtues of both but today losing them worked. I made this card with Basic Black, Real Red and Baja Breeze. I find that I don’t use black nearly enough and since it was already out from yesterday’s card, it seemed perfect. I added a little dimension by embossing the Real Red layer with the Snow Burst Embossing Folder. Some little snowflakes finished it up (another enabled purchase…these ladies are dangerous!). I colored a Basic Pearl with a Sharpie Marker to make it coordinate. Cool! I’ll be back tomorrow with a card from my Christmas Wow Class this week. Yep…another snow man! Thanks for dropping by today. Don’t forget to drop by the Freshly Made Sketches challenge to see the amazing cards from the whole team. Hope you can play this week!